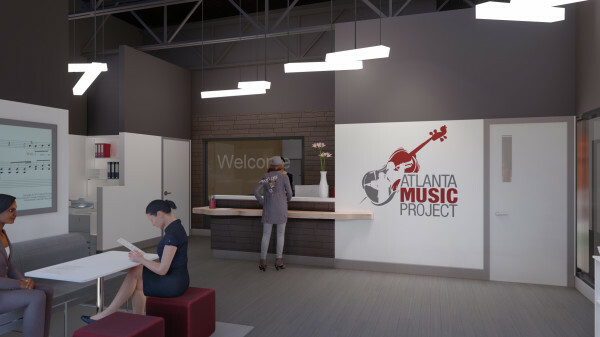 The Atlanta Music Project is pleased to announce the signing of a 12-year lease on a property that will serve as the first ever headquarters for the organization, the AMP Center for Performance & Education. The headquarters will include a 150-seat performance hall, ten rehearsal spaces and office space. 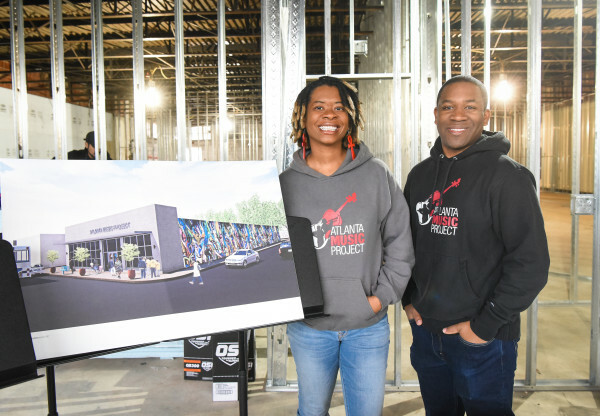 The property is a 7,500 square foot former grocery store located in the Capitol View neighborhood, southwest of downtown Atlanta, and conveniently located within walking distance of both Oakland City MARTA station and the Atlanta Beltline Westside Trail. AMP is excited to establish physical roots in a community we have humbly served since our founding nine years ago. In the spring of 2018, AMP launched The Next Movement capital campaign to transform music education in Atlanta. We are pleased to share that we are 80% to our goal of $2.9 million. Lead gifts to the effort were made by the Chick-fil-A Foundation and the Chestnut Family Foundation. 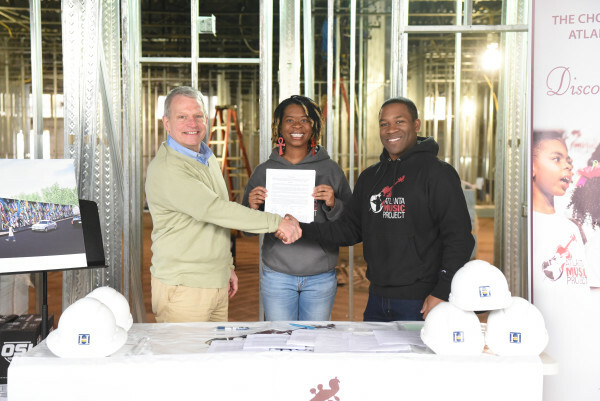 Aisha Moody, co-founder and director of AMP choirs and Dantes Rameau, co-founder and executive director AMP, pose in the future AMP Center for Performance & Education after the lease signing. The Next Movement capital campaign will support the buildout of the AMP Center for Performance & Education, the purchase of modular, sound isolating rehearsal rooms, and key program enhancements including new instruments, concert uniforms and a passenger van. The campaign will also strengthen AMP’s cash reserves and establish a modest endowment. To read the case for support for The Next Movement capital campaign click here. The lobby of the future AMP Center for Performance & Education. Tenant improvements on the property have commenced and AMP will begin its buildout of the space once the capital campaign goal is reached. The architect is Atelier 7 LLC and the construction company is Horizon Construction. Completion of the buildout is tentatively scheduled for the summer of 2019. To learn more about supporting The Next Movement capital campaign, please contact Dantes Rameau, executive director, at info@atlantamusicproject.org or 678-235-4267.